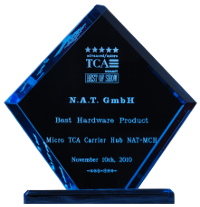 The NAT-MCH is a MicroTCA (uTCA/MTCA) Carrier Hub (MCH) for any standard MicroTCA system. It provides the central management and data switching entity for a MicroTCA system and as such comprises of a base module and numerous optional daughter cards, which can be mounted on the base module. The NAT-MCH is MTCA.0, MTCA.1, MTCA.2, MTCA.3 and MTCA.4 compliant and delivers switching and hub functionality for the various system fabrics as defined in the AMC.x standard series, including Gigabit Ethernet (GbE), PCI Express (PCIe Gen 3), Serial Rapid I/O (SRIO Gen 2) or 10 Gigabit Ethernet (XAUI) or custom protocols based on the Xilinx Kintex-7 FPGA. The NAT-MCH can also provide centralized clock distribution to all AMCs in the system. The NAT-MCH offers a sophisticated clock distribution module that allows a flexible selection of telecom and non-telecom clocking structures in the frequency range between 1Hz and 100MHz. The on-board Stratum 3/3E type PLL can be locked to a clock coming from any of the 12 AMCs or which is externally provided via the front panel SMA connectors. These front panel SMA connectors can also be used to provide an internal clock to external devices, i.e. for synchronizing several MicroTCA systems to exactly the same clock reference. With respect to the PCIe clock, the NAT-MCH supports HCSL signal level as required by PCI-SIG. For special low jitter and low latency requirements applications N.A.T. offers the NAT-MCH-CLK-PHYS together with the NAT-MCH-PHYS and NAT-MCH-PHYS80 products. The Ethernet switches of the NAT-MCH both incorporate a Layer 2, non-blocking, low-latency Gigabit Ethernet switch, supporting port-based and tagged VLAN, Rapid Spanning Tree as well as a port-based rate control. The NAT-MCH always provides service for 1GbE (Fabric A) and optionally service for 10GbE/XAUI (Fabrics D-G). The implementation is according to the respective MTCA and AMC specifications, including PICMG SFP.1 R1.0, serving up to 13 AMCs (12 AMC + AMC13 in 2nd MCH slot) as well as the update channel from the second MCH in redundant environments. The NAT-MCH also provides uplink ports on the front panel for both fabrics in order to interconnect to other systems. The PCI Express switching hub allows PCIe Gen 3 connectivity for up to 12 AMCs at PCIe rates from x1 to x4. The PCIe chipsets provide a quality of service (QoS) module and are configurable in terms of a non-transparent port for multi-host support. The PCIe option can provide a PCIe clock at HCSL signaling level by a spread spectrum clock (100MHz mean) or a fixed 100MHz clock. The PCIe hub provides clustering support for six independent clusters with one configurable non-transparent upstream port. Each cluster offers its own transparent upstream port. The NAT-MCH can also be optionally equipped with a Serial Rapid I/O (SRIO Gen 2) switching hub to support very low latency point-to-point connectivity between up to 12 AMCs. The SRIO hub supports x1 and x4 lane configurations. Although it is SRIO Gen 2, the switch module is backwards compatible to SRIO Gen 1 and supports any mixture of SRIO Gen 1 and Gen 2 AMC modules. This special hub module combines a fast and low latency SRIO Gen 2 switch with a fully-customizable Xilinx Kintex-7 FPGA. It can be used for switching or multiplexing CPRI (Common Public Radio Interface), OBSAI (Open Base Station Architecture), standard (e.g. SRIO, XAUI) or any customized serial protocols, establishing a highly adaptable and flexible interconnect for up to 12 Advanced Mezzanine Cards (AMC) in a MTCA system. Using the SFP+ connectors, external signals can easily be brought to the system, be manipulated by the FPGA and then distributed to the AMCs. LTE and WiMax applications and others such as Software Defined Radio (SDR) could benefit, for example, by directly providing antenna signals to a farm of high performance digital signal processor (DSP) AMCs. Other applications, such as test and measurement equipment, requiring both a manipulation of the data stream and low latency switching at the same time will benefit from the unique design of the NAT-MCH-FPGA, for example, by reducing the slot count and thus saving costs or releasing slots for additional functionality. Apart from the high speed serial connections, the Kintex-7 FPGA has access to two independent DDR3 memories (up to 4Gbit each), a low jitter PLL and a Gigabit Ethernet connection to the MCH base module switch. This allows you to implement complex user functionality and therefore can save a full AMC slot. The NAT-MCH incorporates a MicroTCA Carrier Management Controller (MCMC) which supports and manages up to 12 AMCs plus AMC13 in the 2nd MCH slot of a redundant system, 2 cooling units and 1-4 power modules. The support of a 13th AMC requires a redundant system where the redundant MCH slot is used by this AMC. Special care has been taken to support numerous aspects of system architectures, such as E-Keying, redundancy, load sharing, clocking, fail-over scenarios and system integrity. External system or shelf managers can conncet to the NAT-MCH via the Ethernet front panel ports. For remote control, N.A.T. provides the Java-based application NATView. Based on the HPI recommendation of the Service Availability Form (SA Forum,now merged with PICMG), NATView accesses the NAT-MCH via Remote Management Control Protocol (RMCP) as required by the MicroTCA.0 specification. The NAT-MCH fully supports redundant management and power environments. Frequent exchange of the internal databases with the secondary MCH and a heart beat mechanism ensure an immediate switch-over from the primary to the secondary MCH whenever it becomes necessary (PCIe fat pipe switch over may require additional precautions). The NAT-MCH-PHYS can handle up to four power modules (such as NAT-PM-DC840 or NAT-PM-AC600) for N+1 configurations. Apart from the Java GUI NATview, the NAT-MCH also supports external management solutions which are based on the Remote Management Control Protocol (RMCP), such as the open-source tool ipmitool. Furthermore, using the NAT-MIB the NAT-MCH can also be integrated into environments based on the Simple Network Management Protocol (SNMP). The NAT-MCH can be configured using either uploadable text based script files or via the integrated WEB interfaces using a standard web browser. Finally, the integrated debug and configuration facilities can be accessed via a serial console or using Telnet. Customers registering for the firmware update service are automatically notified by e-mail when a new firmware version becomes available. Please follow this link for an overview about the various mezzanine modules which are available for the NAT-MCH family of products. -CLK123 Telecom Clock Module - Stratum 3/3E Telecom clock module supporting CLKs 1,2 and 3. PCIe Spread Spectrum Clock (HCSL) Clock module combining Telecom CLKs 1 and 2 with a PCIe spread spectrum or 100MHz fixed mean clock at CLK3 (HCSL) to all AMCs. CLK2 of one of the 12 AMC modules or the front panel clock input can be selected as reference clock input for CLK1. -CLK00F PCIe Spread Spectrum Clock - HCSL Clock Module supporting a PCIe spread spectrum or 100MHz fixed mean clock at CLK3 (HCSL) to all AMCs. -CLK-PHYS Physics Clock Module Clock Module providing special clock functionality (CLK1-2) dedicated to Physics applications and a PCIe spread spectrum or 100MHz fixed mean clock at CLK3 (HCSL) to all AMCs. -PCIEx48 PCIe Hub Module for Fabric D-G PCIe Hub module with support for 12 AMC modules.